Home > Archives > W. Graham Claytor, Jr. in front of Washington Union Station, 1988. 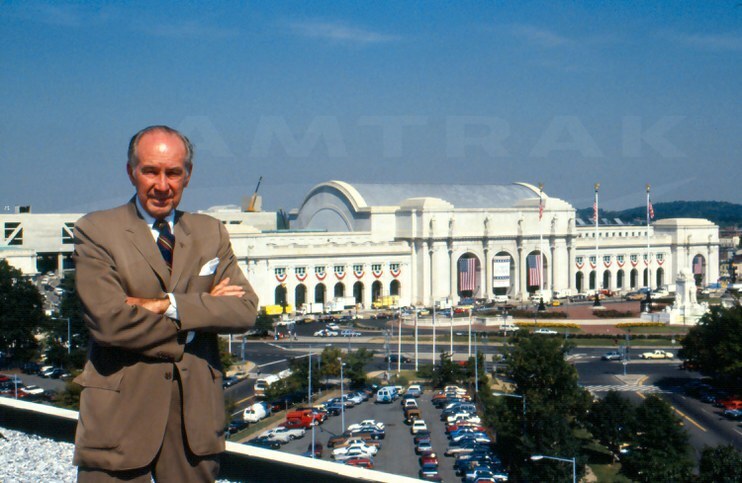 W. Graham Claytor, Jr. in front of Washington Union Station, 1988. Color photograph showing Amtrak President and Chairman W. Graham Claytor, Jr. with recently restored Washington Union Station in the background. Image dates to 1988. Completed in 1908, Washington Union Station is a Beaux Arts landmark designed by famed architect Daniel Burnham. The front of the station presents travelers with soaring archways and heroic statuary on its 600-foot length. The 96-foot high coffered Main Hall ceiling shines with gold leaf, reflecting light onto the expanse of its marble floor. Shuttered in 1981 and threatened with demolition, the station was later rehabilitated through one of the largest, most complex private-public partnerships undertaken in the United States. The beautifully restored building reopened in 1988. More than a century after it was finished, it serves as a vital intermodal hub for the nation's capital and includes scores of restaurants and shops. Amtrak moved its corporate offices to the station following the renovation, and they remain there today. Photographer: Unknown. From the Ann Owens collection.